Carolina Chickadees are a year- round resident bird of Wilmington and surrounding areas. They are brave for their size and can become quite tame in human-frequented areas. 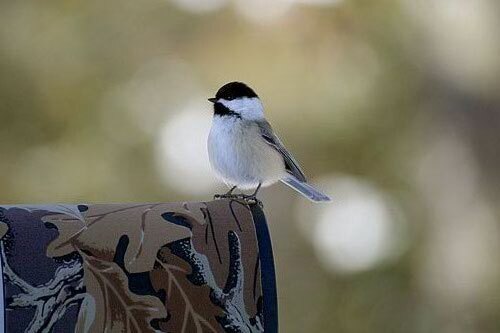 The name "chickadee" comes from one of their familiar calls, which sounds like they are saying 'chi-cka-dee' or sometimes 'chi-cka-dee-dee-dee-dee'. The females and the males look similar. Chickadees commonly travel in feeding flocks and are quite vocal. They are quite acrobatic as well, and will even eat hanging They can be considered one of the 'alarm birds' of the forest, meaning they make a lot of noise when a predator or threat is around such as a hawk, raccoon, or snake. 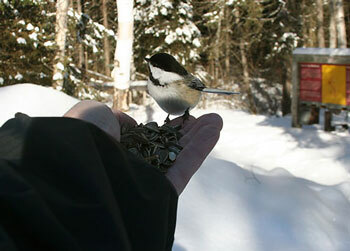 Chickadees are cavity nesters. They build their nests in holes in trees and will also use bird houses. 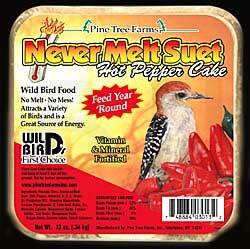 Click here to see Wild Bird & Garden's selection of birdhouses suitable for chickadees. Some of the chickadee's favorite foods are sunflowers, peanuts, and suet so they are easily attracted to backyard feeders. Click here to check out Wild Bird & Garden's bird food selection! Carolina Chickadee poses on a pine branch. Carolina Chickadee poses a large camera lens. Carolina Chickadee eats sunflower seeds from a lucky birdwatcher's hand. 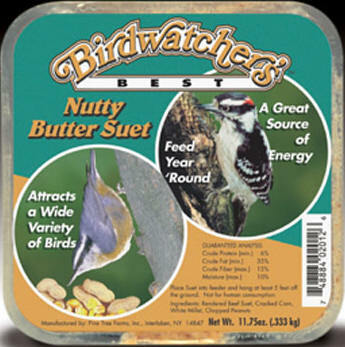 To the right are some suet blocks available from Wild Bird & Garden that Carolina Chickadees will eat. Other foods chickadees like include sunflowers and peanuts- which are also sold in our store.